Gallstones are hard materials in your gallbladder, and the purpose of your diet for gallstones is to prevent pain and recurrence. A diet for individuals with gallstones may seem limited, but it can probably include yogurt in moderation. Keep in mind that many dietary and other factors affect your risk for gallstones, and your doctor can give you the best advice for staying healthy. Yogurt can be a healthy component in your diet if you use it to control your calorie intake, because a healthy weight may help prevent gallstones. Yogurt is relatively low in calories, and it is filling because of its high amount of protein. For most overweight or obese individuals, a healthy rate of weight loss is a moderate 1 to 2 lbs. per week. Rapid weight loss and fasting increase your risk for painful gallstones. Yogurt may help prevent gallstones because of its low glycemic index. 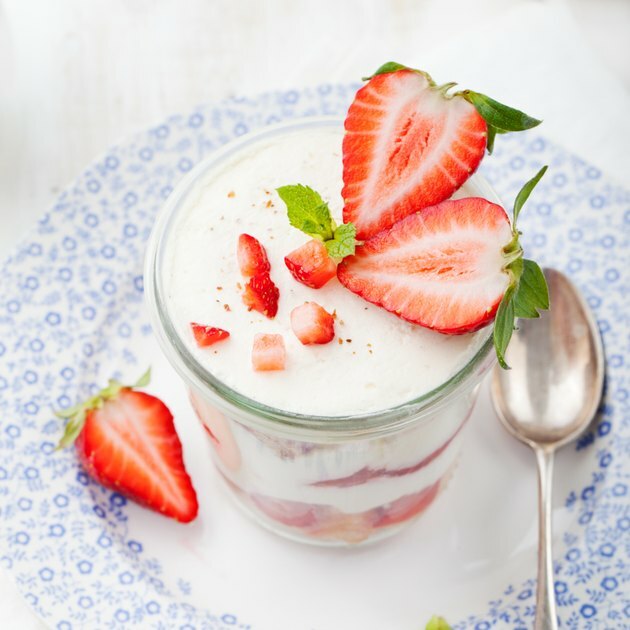 The glycemic index of a food indicates its potential effect on your blood-sugar levels, and low-glycemic foods, such as yogurt, do not spike your blood sugar. When you eat too many high-glycemic carbohydrates, such as sugar, dried potatoes and white bread, you may develop or exacerbate Type 2 diabetes. Diabetes is a risk factor for gallstones. Your risk for gallstones may increase when you get your protein from red meat, according to the University of Maryland Medical Center. Yogurt can be lower than fatty meat in unhealthy saturated fat as long as you choose low-fat or fat-free varieties. Milk is naturally high in saturated fat, and yogurt made from whole milk has 5 g saturated fat per cup. Refined sugars may increase your symptoms from gallstones. Plain or artificially sweetened, no sugar-added yogurt is a better choice than fruit-flavored yogurt with added sugars. A diet to prevent gallstones is high in fiber, antioxidants and unsaturated fats. Some ways to increase your consumption of these healthy components are to eat your yogurt with a whole-grain cereal or fruit. The whole grain and fruit provide fiber, and fruit provides the antioxidant vitamin C. For a snack, yogurt with nuts or flaxseed can give you monounsaturated fat, polyunsaturated fat and vitamin E. Consult your doctor for more ideas about preventing complications from gallstones.